Last night was one of the most delightfully unusual nights I've experienced at SIFF 2015. I saw a pair of films separated by forty years: one a silent film long though lost and another an eye-popping 1960s spectacle of song, martial arts and sorcery. Both are based on an episode in the Ming dynasty fantasy classic novel Journey to the West. 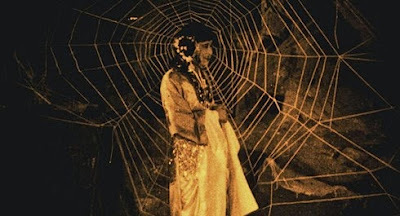 Cave of the Spider Women (1927) is the first screen version of the tale, while The Cave of the Silken Web (1967) is the colorful Shaw Brothers take on the story (the first has a long lost sequel, while the remake is part of a trilogy). When I arrived at the SIFF Uptown, the scheduled theater for the films, I was given a flyer directing me to the SIFF Film Center a couple of blocks away for the Cave of the Spider Women screening. The venue change was good news, because now the movie could be shown in its original 18 frames per second format. The theater is also a wonderfully intimate place to see silent films when the only accompaniment is a keyboard, as it would be this evening. The film of this Chinese fantasy story was thought lost for over ninety years. It was found in an unmarked can in a Norwegian film archive, restored and presented to Chinese authorities in April 2014. As the intertitles were in Norwegian and Mandarin, it was most helpful to have SIFF Director of Programming Beth Barrett along to read from a translated script. 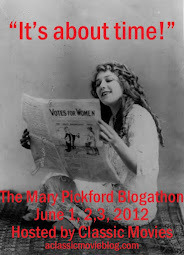 My favorite silent film accompanist Donald Sosin provided the music. As usual, he produced the most astonishing sounds from his electric keyboard. I used to find these instruments so cheesy, and dreaded any screening where they would be used to provide soundtrack. Sosin has proved me wrong. He is a confident, inventive artist. I loved the way he mixed lush classic sounds with unusual effects and flourishes. Though the presentation was only an hour, and the first reel was missing, watching Cave of the Spider Women was lots of fun. It's the story of a Buddhist monk on a quest for a sacred text with his traveling companions, including Pigsy, Monkey and a Dragon Prince. The bumbling group is lured into the cave lair of a deadly group of women who are really spiders in disguise. Somehow these ladies have learned that eating the flesh of a monk will make them immortal, so they set out to make a meal of their captive. I don't know if I would have understood much of what was going on without reading up on the film beforehand, and I don't think I would have cared either. This playfully vicious fantasy is full of action, humor and great visuals. The spider ladies are always amusing to watch. They're glamorous, tough and cheerfully amoral, which must have been empowering for ladies who viewed the film upon its initial release. 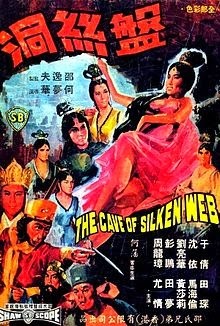 When the film was over, the audience was encouraged to walk back over to SIFF Uptown to watch the Shaw Brothers version of the tale, The Cave of the Silken Web (1967). This sexier, glossier take on the tale was a sort of musical, with characters singing about their desires. It was most unusual to see the scantily dressed spider ladies dancing together while crooning about their plans to eat the monk's flesh. While there's not quite as much martial arts action as in your typical Shaw production, there's enough to keep the blood pumping. The mix of location filming and elaborate cave sets worked better than I would have expected, and I'm sure this is partly because the whole production is so outlandish that you're willing to accept almost anything. The film looked great, stretched across the screen in gorgeously colorful Shawscope. I also loved the elaborate costumes and the monkey character's very monkeylike make-up. He actually seemed like an animal to me. This was such a fascinating night. I enjoyed the inventive way SIFF programmed the event, providing value and great contrasts for its audience. Thanks for your review on these films. Glad to know they're being exhibited and appreciated! That was a memorable night!